The construction, design or operation of a stationary ammonia system is not to be allowed or implemented, until the director approves of the system. Each filling connection should be provided with back-pressure check valves and excess flow valves, or a positive shut-off valve in conjunction with an internal back-pressure check valve or an internal excess flow valve. Each container that is housing anhydrous ammonia should have a pressure gauge that is designated for ammonia storage. Each container must be marked on at least two sides with the words “Anhydrous Ammonia” in contrasting colors with the letters no less than four inches high. Signage, including a plant registration number that is assigned by the Ohio Dept. of Agriculture shall be implemented stating “the plant name, address, and phone number of the nearest representative, agent, or owner of the storage system, an emergency phone number and the phone number of the nearest fire department”. Proper warning signage including the NFPA 704 classification sign must be implemented on the exterior of the chemical storage building regarding Ohio fertilizer storage. Containers housing Ohio fertilizer storage or anhydrous ammonia shall be located outside of any building or in a chemical storage building. Chemical storage buildings housing anhydrous ammonia storage must be located at least fifty feet from a dug well or other sources of portable water supply. Electrical equipment and wiring shall be general purpose or weather resistant. We recommend explosion proof fittings, and explosion proof electrical accessories when storing anhydrous ammonia. Any farm fertilizer storage building that stores fertilizer for more than 30 days must have a secondary containment. Every secondary containment implemented into an Ohio fertilizer storage building must have 10% more volumetric capacity than the largest storage tank located within the containment area. At US Chemical Storage our experienced professional engineers know the exact dimensions of what size containment sump is needed for the amount of fertilizer that you are storing. Our fertilizer storage buildings are hand-welded from extremely strong 12-guage steel and are 100% customizable. When storing anhydrous ammonia, it is important that the fertilizer is maintained with the proper accessories. 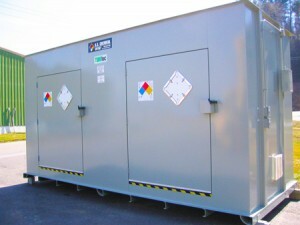 A well-ventilated storage building is necessary, along with explosion proof accessories, dry fire suppression system and explosion relief construction. Find more state regulations and requirements by visiting your State’s Department of Agriculture.